Below is our immensely popular 2017 Big Ten Football Helmet Schedule. The Big Ten Helmet Schedule is designed to help you easily find this week’s football matchups for all the Big Ten schools. The Big Ten Football Schedule was completed by the Big Ten Conference well in advance, but we do have a few games and date changes each season. Our Big Ten Helmet Schedule has been updated with these changes and should feature the current games and dates. We pulled each of the Big Ten team’s schedules for this season and designed this year’s Helmet Schedule. Our Big Ten Helmet Schedule is so pretty we know you’ll want to frame it and hang it on your wall at home or in the office. Please take a look at our convenient, one page 2017 Big Ten Football Schedule Grid here. Our Big Ten Football Schedule Grid is perfect to cut out and put in your wallet for safe keeping. 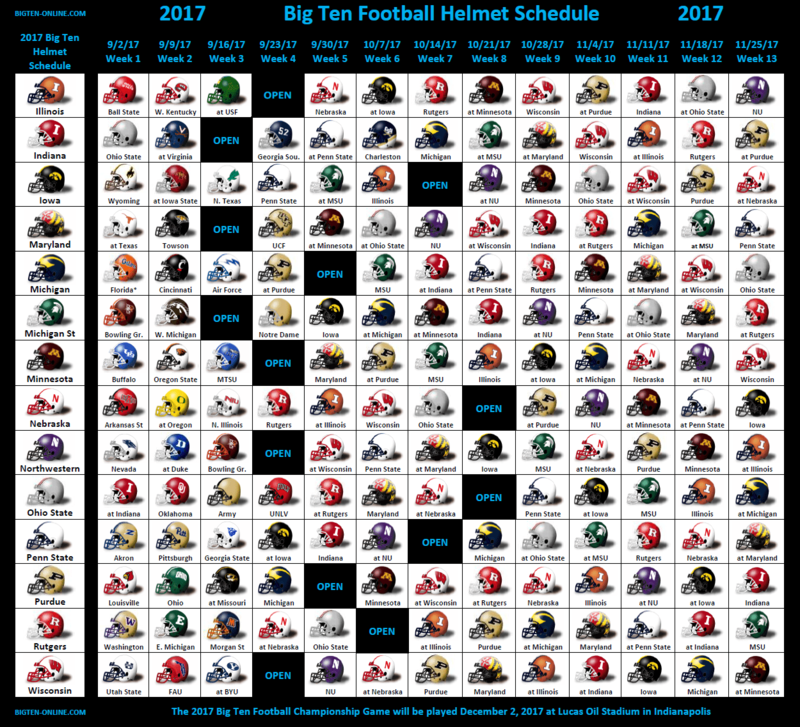 Click here for our 2017 Big Ten Football Helmet Schedule PDF.